The sequel to the popular Temple Run was released on January 24th for Android and January 21st for iOS. Temple Run 2 features improved graphics, new obstacles, and different abilities. The sequel isn't that much different than the original, both are linear based sprinting games where you help an Indiana Jones-esque man/woman run from a giant black bear thing who presumably stole something - most likely the treasure hidden in the Temple. You control the character named Guy Dangerous (or whichever character you chose), by tilting the device left and right to collect coins, swiping up to jump over gaps in the path, swiping down to slide under fallen trees and jet streams of fire, and swiping left and right to make him turn around a corner. Adding to the original Temple Run, Temple Run 2 features a new cart component that puts your character into a cart which they control by leaning left and right somehow. The carts utilize the same mechanics as on foot, essentially being eye-candy. Collecting coins in the game allows you to purchase other characters which unlock special abilities, or upgrade your power ups. Temple Run 2 features the same characters and power ups as the original Temple Run, but has introduced special abilities as well. Special abilities are power ups specific to your character that can be activated by double tapping on the screen when the power meter on the top-left corner fills up. These special abilities are unlocked at certain levels or when new characters are purchased. Temple Run 2 also introduces a new leveling system which progresses by gaining achievements such as running 500m without collecting any coins. Coins aren't the most valuable in the game though, what you want are gems. Gems are found while running similar to power ups, and can be used to save yourself if you trip and die, or run face first into a tree. 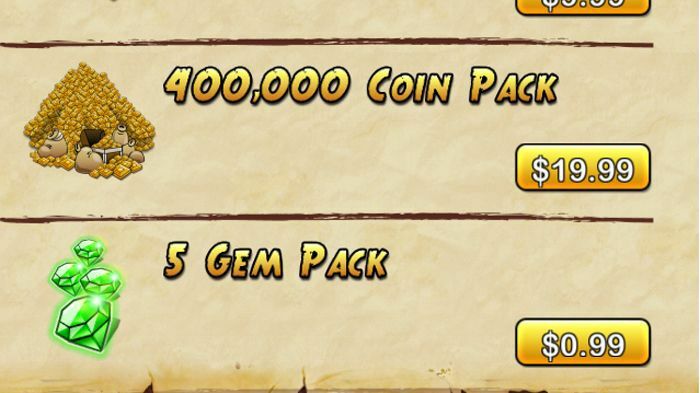 If you would rather trade your hard earned cash for virtual gems or coins, they can be purchased from 99 cents for 5 gems or 5,000 coins, to $19.99 for 500 gems or 400,000 coins. Pick it up here on the Google Play Store or the App store.